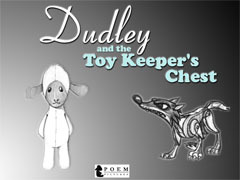 This 14-minute storybook fantasy tells the story of Dudley the lamb, the only toy ever created by the world’s finest toy mender. Dudley’s nemesis, the evil wooden wolf Silas, has been terrorizing the store where they live. When Silas turns his menacing teeth toward Dudley ‘s creator, the little lamb must defend his home. Written and Directed by Patrick Algermissen and Produced by Orion Martindale, Blue Juice’s Thomas Mumme served as Director of Photography. Blue Juice also provided the gear, crew and on-line editing facilities for this award-winning film. 7th Annual Melbourne Independent Filmmakers Festival, Melbourne, FL – November 2005, Winner of the Space Coast Film Commision’s Excellence in Florida Filmmaking Award & a Special Achievement in Cinematography. This entry was posted in Films, Portfolio by admin. Bookmark the permalink.